For Nancy Lord, what began as a yearning for adventure and a childhood fascination with a wild and distant land culminated in a move to Alaska in the early 1970s. Here she discovered the last place in America "big and wild enough to hold the intact landscapes and the dreams that are so absent today from almost everywhere else." 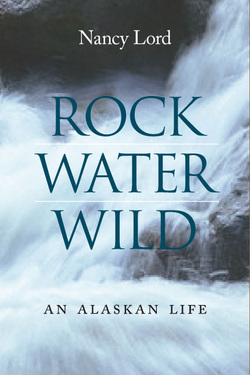 In Rock, Water, Wild, Lord takes readers along as she journeys among salmon, sea lions, geese, moose, bears, glaciers, and indigenous languages and ultimately into a new understanding, beyond geographical borders, of our intricate and intimate connections to the natural world. Vast and beautiful, and much more than a mere place, Alaska is nonetheless inescapably a land of natural extremes and exquisite subtleties. Lord's explorations evoke reflections on the importance of place and space in our lives; arguments over roads carved in the wilderness; musings on the role of location and landscape in the Dena'ina Athabascan language; accounts of sport fishing in the Russian Far East in the first days of perestroika and of climbing in the Arrigetch Peaks of Alaska's Brooks Range; and considerations of the politics of whaling. In the tradition of naturalists John Muir and John Burroughs, Lord proves an excellent guide to the challenges and pleasures of making oneself at home on this Earth. "Throughout this collection, Lord brings to each image, each sentence, the sharpness of seeing with love, as did Muir and Burroughs before her. . . . How we live matters—to us, to our community, to wild creatures and to the world. This book matters too—for its vision, its fascinating perspectives, its good sense, its powerful and evocative prose." "[Lord's] writing is a gift to the intelligence of those of us who wish to understand our human occupation of this Earth--what we have done and are doing, and what we may learn for the betterment of our future." "Nancy Lord says that for her, living and writing are stones that she turns over and over in her hands, all through her thinking life. For me, her books have been bright reflections from those well-polished stones--clear messages from a life lived well, out of doors, in the North. . . . You will read this book with pleasure and wonder--and afterward, the world will be a larger, better place." "Alaska's writer laureate explains how the state sets 'the standards for what's loveliest and most necessary in the world.' Lord (Beluga Days: Tracking the Endangered White Whale, 2007, etc.) brings an impressive awareness to this collection of essays, which she humbly describes as 'attempts to learn, to discover, to wander around in ideas as I try to reach understandings.' She characterizes Alaskans as self-inventers, restless yet comfortable with quiet and big, open spaces. The wilderness is full of intact landscapes and obvious linkages, writes the author, both in its natural systems and between the past and the present. In forays to old mining camps, forests wilting before the spruce bark beetle epidemic and well-isolated rookeries and islands, the author patiently waits for the landscape and its many stories to reveal themselves to her. Lord is also politically adept and sensitive, alert to threats like the 'dysfunctional, irrelevant, and divisive' International Whaling Commission. She is in love with not just the wild, but the ways in which humans have interacted with it and recorded its dimensions for posterity. She closes with an ample display of her writing chops, allowing readers to take her measure as a well-rounded person—a baseball fan, the daughter of a father with Alzheimer's and a believer in the elusive ivory-billed woodpecker, confided in a lovely staccato piece as jumpy as the bird's alleged sighting. A protective love story of a place of vast, otherworldly beauty." Read a particularly thoughtful one by Brian Keenan in The Northern Review here. Read another by Fairbanksan David James. There's also this at High Country News by Michael Engelhard.